My husband Laine and I have joked for years about doing a Cape Cape Modern design scheme (the two capes being Cape Town and Cape Cod) at home. And well, that day has finally come! You might remember that for a long time our home featured a very mid-century inspired aesthetic - an "Atomic Safari" Apartment Therapy said. My goal this time around was to go more Hemingway in Africa, than say, Don Draper. I've got a penchant for dark, exotic woods, rich leathers - I mean really anything you'd find in an old-timey gentleman's smoking lounge. And then add in those coastal touches. I started with a new sofa and built around that, mixing elements we already had with a few new ones to inject the space with new life and really tie the theme together. 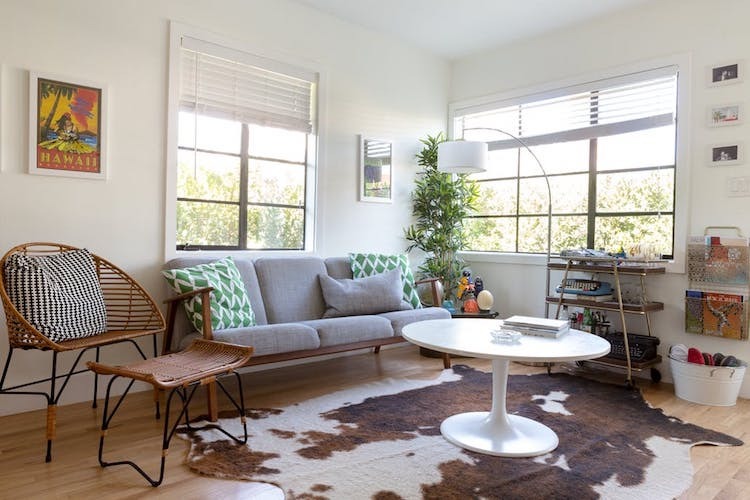 Scroll through below to see the full #mervhaus living room redesign. First, I found the right sofa. I knew it was a leather chesterfield or bust. Given our small space, I also wanted a slimmer, more modern profile than a lot of your typical chesterfields. This savile leather tufted sofa from CB2 was perfection. This is the original moodboard I put together before I started. It's rich in textures and materials, and weaves together an ideal color scheme for this modern-meets-coastal look. We don't have a lot of large art, so I've grouped our vintage travel posters together to fill this wall. Yes, those are Hawaii travel posters underneath the Africa ones. And before you're all "but that's not either cape," I love Hawaii. So, whatever, just deal with it. The rattan chair was an existing piece from Target's Threshold collection. I've added a sheepskin to cozy it up as well as a blue pillow to carry through the color scheme. This large area rug from One Kings Lane was really the exclamation point on this room. It brought everything together. Just before I laid it out, I was about to say goodbye to our amazing Saarienn Tulip table Craigslist find. When I placed the table on top of the rug though, I knew it had to stay. The rug is also technically an outdoor rug so cleaning is easy, plus it doesn't catch every single Fitz hair like some others we've had before. 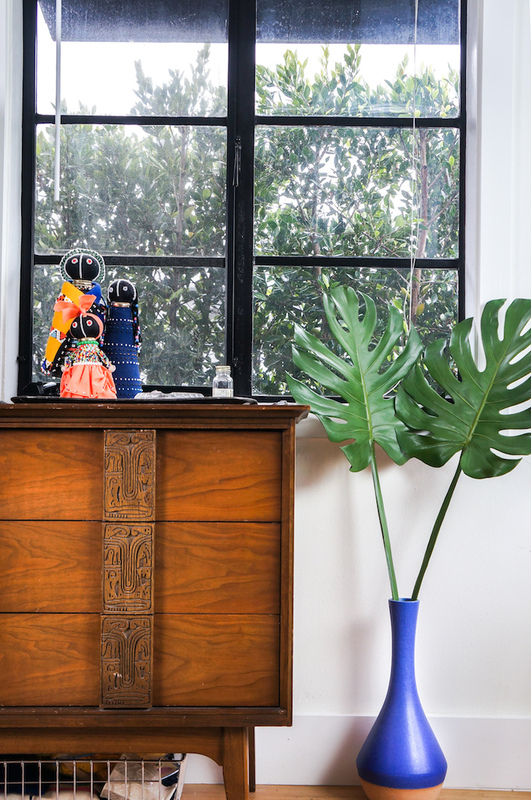 Shack Chic is a visual journey of interior design throughout South Africa's shack lands. I inlcuded a "before" photo above for you to really see the difference. It's amazing what some re-arranging can do! So basically every time Laine goes to work, takes Fitz for a walk, gets the mail, he comes back to find the living room in a different configuration than when he left. The one thing that doesn't move around in this living room? Fitz. He'll just lay here on the sofa and sleep for hours if you let him. LIke during this photo shoot. The room really needed one focal piece of art. The paiting hanging above the sofa is an oil painting I tracked down off Craigslist. The garish frame is fantastic in that old-timey-gentleman's-smoking lounge-kind-of-way I love. Woven blue and white baskets from The Container Store give us shoe storage under the sofa. We can grab what we need as we head out the door! For the half blue wall, I used Dunn-Edwards Signing The Blues. Stripes + Rattan + Krisel. It's how cape meets cape meets modern. Bookshelves have been a much-welcomed addition. We swapped our bar cart for the ladder bookshelf above. It's allowed us to display everything that was previously stashed on the bar cart plus more! What do you think - Like the new look? Prefer the "before?" Let me know your thoughts in the comments.